Guest bathrm before & after. Our guest bathroom is done (for now) so it’s time to reveal. I first have to thank a few people for their contributions to this project. -Thank you to my wonderful handyman husband for helping me position and reposition the stencil at least 150 times at midnight and helped me with the crown molding. All this without questioning my sanity. -My sincerest thanks to my dear friend Michelle who is also the genius behind Wondertime Photo and snaps all the “after’s” in my home. With no trace of natural light anywhere in the bathroom it was not the most ideal space to photograph. At one point Michelle turned off all the lights, used a long exposure and was able to get great shots. Who woulda thought? Talk about a professional. Thanks for being such a cheerleader. -Last but not least, thank you to my project sponsors Dutchboy paints, Cutting Edge Stencils and Ghost Nest Hardware for sending me their fabulous products to test. More about their products this week. If you remember this house is not even three years old so everything is still in very new condition… just very “builder bland”. My challenge was to simply spruce it up. The first thing I did was paint all the walls in a calm, neutral color called Stonewall Jackson by Dutch Boy. Then I replaced the mirror with this framed mirror. It was once gold and hanging above my piano. I also painted the cabinet black. 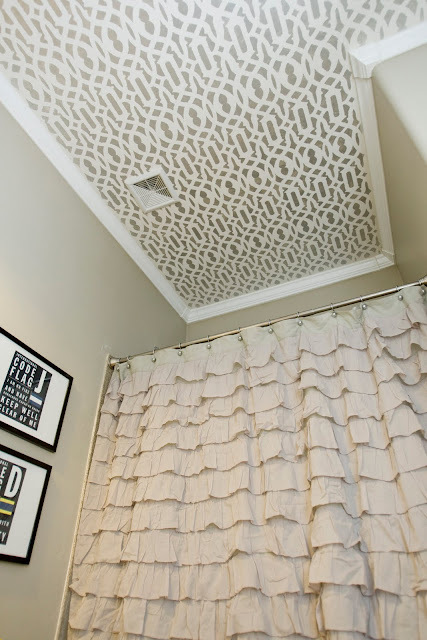 I Stenciled the ceiling with this great trellis pattern and added crown molding. It is one of Cutting Edge Stencil’s newest patterns. That was a task! I had silver paint in my hair for days after I finished this because I sponged it rather than rolled it on. Next, I changed out the existing, generic light for this very affordable and eclectic barn light in red. I once read somewhere (someone help me out here) that a designer said every room is worthy of a bold pop of red. Here’s that advice fulfilled. Couldn’t ignore the hardware details. 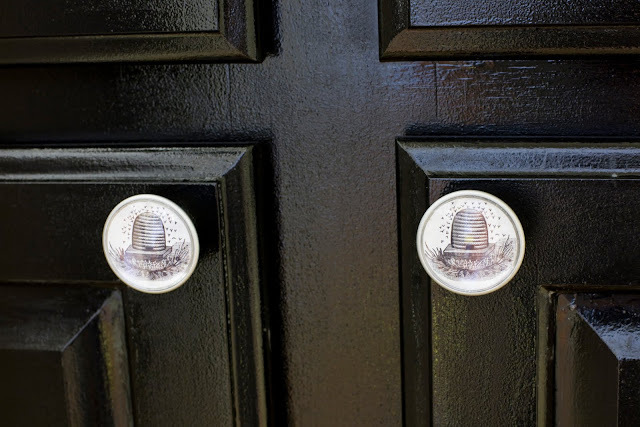 These unique knobs are from Ghost Nest. They are meaningful to me because I grew up in the Beehive State (Utah). More about this cool company this week. Then I added some art and accessories. I found this bird (cast iron? REALLY HEAVY!) at Tumbling Tumbleweed Antiques. It was all rusted and felt too shabby chic so I modernized it by spraying it yellow. Before I accessorized this room it felt a little monochromatic. 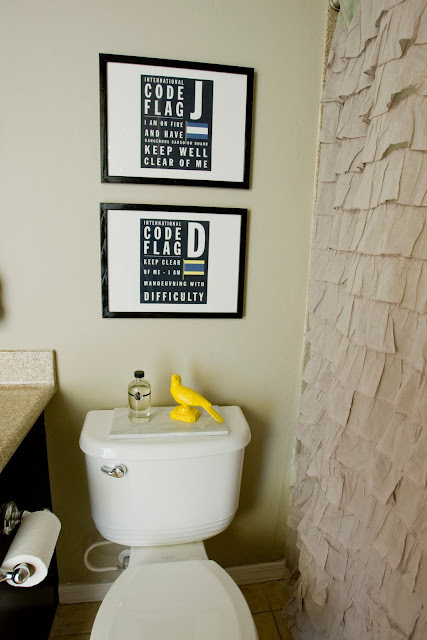 It really needed some pops of unifying color so or course I added bold hits of yellow. This vintage cabinet was my most fun score. I looked for months for something to fill this odd little space with funky dimensions. I found it at the Paris Flea Market here in Tucson for $10.00. I covered the shelves in wrapping paper then took off the door so I could use it as storage and display. 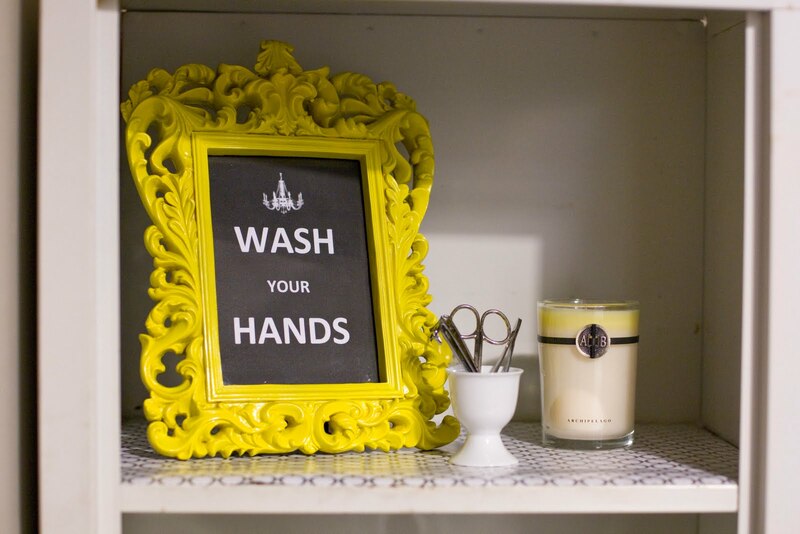 This frame is from HomeGoods and was gold. I diy’ed it up a bit by spray painting it yellow. I then did my own little take on the “Keep Calm and Carry On” print and made my own reminder to my boys with the help of my computer. When I was in Lexington Virginia I found this antique soap dish attached to a marble block. This week I’ll post more about my project sponsors and diy projects in this room. Stay tuned! “Sprucing Up” is a huge understatement. This is fabulous! I adore the ceiling, even if it did cause you to temporarily look like you had premature graying of the hair. WOW. I thought the before was a nice bathroom, but the after is amazing! I love the ceiling and the pops of red and yellow. LOVE LOVE LOVE the ceiling!!! I have heavily textured ceilings so I’m stuck ! That ceiling is fab-u-lous! I have purchased a few simple stencils but still afraid to use them. You’ve out done yourself with this project. Great job Michelle. So many fun and funky things to look at! I just love all of those interesting accents. I have NO idea how you did a stencil on the ceiling though, you must have a lot of patience! Holy crap…where do I start…..It is freaking awesome! LOVE LOVE LOVE the ceiling, the light fixture, and the pop of yellow. YOU are amazing! That ceiling is AMAZING. I admire your patience and ingenuity. The whole room looks great. Amazing job! I love, love, love the red light fixture. So fun with the yellow. I love the neutral with pops of color. The light, the bird, the frame…love it! And the ceiling looks amazing! I also love that shower curtain! Okay… I think I love it all! Super amazing ceiling, I just love it! Looks like it was a job but oh so worth it! OH my goodness. This is the most gorgeous bathroom I have seen in a long time. So glad that you got rid of the “builder” bland!! Really beautiful transformation. While your “before” was just fine, the after is gorgeous – especially that ceiling! Love the neutral backdrop for the pops of color – I’m a big fan of that. Thanks for sharing! GORGEOUS! Love the pops of color and the ceiling stenciling — great whimsy and interest! AMAZING! i love it and am totally inspired by your creativity! the bathroom looks amazing. I really like the special touches you put on the room! That looks amazing!! I just love the ceiling! That is a great idea. and you are right about the pop of red. It is gorgeous!! Love ever detail! Love the personality that you put into this bath! Awesome bath redo! No builder basic here! Beautiful job! I love your pops of color…and that ceiling is a work of art! Love the shower curtain too! gorgeous! 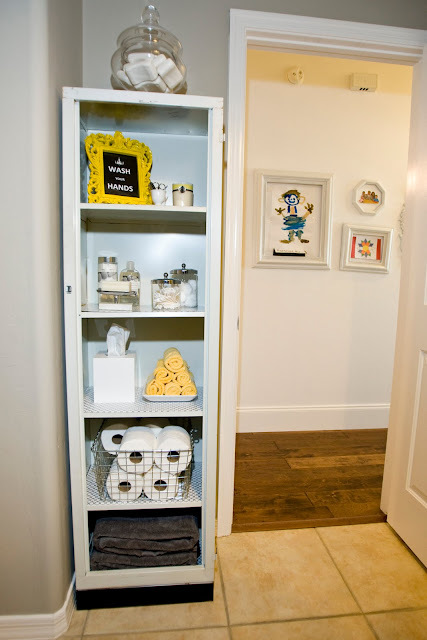 loving that cabinet, and your items in all the shelves. looks so cohesive, and your print for wash hands is great! fantastic job! AMAZING!!!! The first picture I saw I said OMG out loud at my desk. Good thing no one is in the office yet. Wow! It looks so AWESOME! I love how your ceiling turned out!!! Beautiful job per usual! I love the stencil, but wow I bet your shoulders hurt. 🙂 Also the little pops of color are so great, and that cabinet, what a find. Amazing! I’m speechless! Love the pops of yellow and the red light fixture, the shower curtain is dreamy, your stencil work is amazing, and that cabinet for $10!? Holy cow girl! Awesome job, I love every square inch of the reno-ed space! 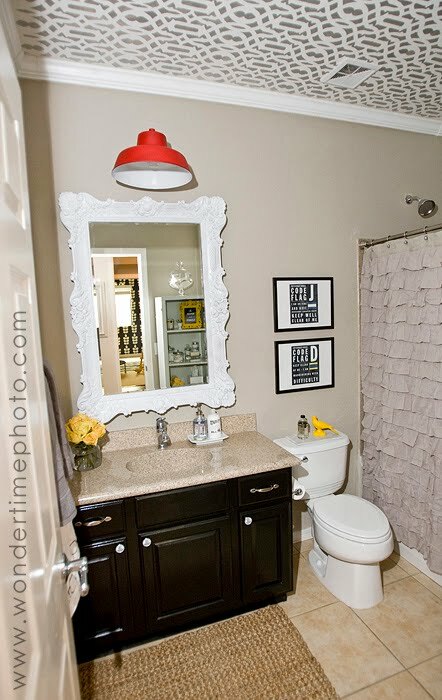 I love how you added the red and yellow pops… and the shower curtain is super cute – with all its ruffles. I had stumbled across your blog by sheer luck and may I just applaud you on your exquisite taste and eye for design. You have motivated me in more ways than one to revamp my place. Just as I was pondering what I could do to my very vanilla guest bathroom … you posted these photos! I LOVE the ceiling! And you have inspired me to do something about the HUGE mirror in my bathrooms. We have 10 foot ceilings and the mirrors are so tall that the only space left between the mirror and the ceiling is for the overhead light (which is so high up that it casts and unfavorable light and my face always looks awful). Your shower curtain has also now inspired to buy this shower curtain: http://www.victoriantradingco.com/store/catalogimages/1a/i15047.html. I’ve been eyeing it for months! I love it!!! So great! I am definitely going to try this out. I am somewhat restricted as I am renting at the moment but will be filing this away for later use. Love the pops color! Gorgeous!!!! I love the shine on the black cabinets! Wow! You are one brave lady – stenciling on a CEILING! You must’ve had a creak in your neck for days, too! PUNCHY! I love all your changes. The red light is my favorite. Such an unexpected type of fixture, but it’s so fun. I can’t believe you stenciled the ceiling! Hopefully you got a massage when all was done. Excelent work! I just love the curtain, want one for me, and love the ” Wash your ands”!!! michelle, it looks amazing! you seriously can do no wrong!!! you rock girl! i have so enjoyed watching as your blog has grown by leaps and bounds. congrats on all the success. Love love it. We have the same issue w/our house being NEW, but very builder’ish .. lol. I love everything you did. So brave painting the cabinet black — it looks fabulous! I drive by Paris Flea Market all the time (my husband works at the bank just east of it) and have yet to stop. Looks like I need to visit ASAP. Thanks for the headsup! I love the ceiling and the shower curtain! 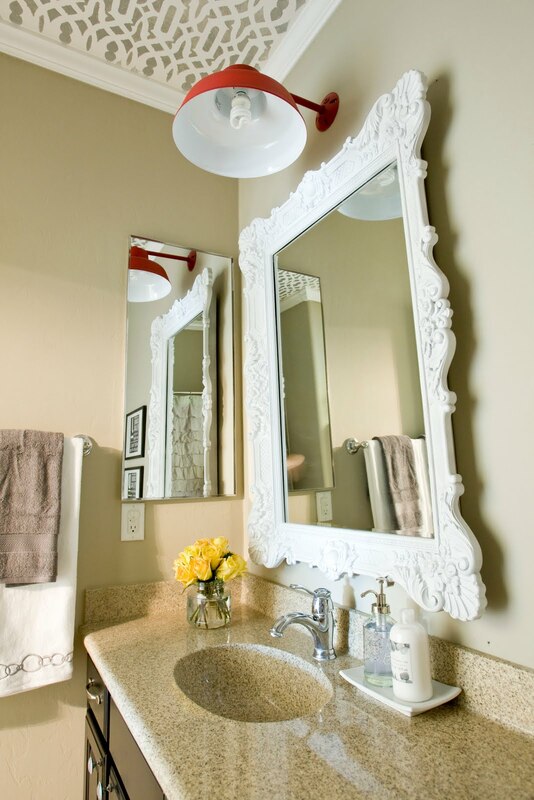 wow, if this is just sprucing up, then I am in dire need of the same…in my entire home. Wow that’s all I can say … I am in love with the ceiling design, the shower curtain and all the details on the shelf … well actually the whole room … I found your blog from a picture of the well-documented stripes that you painted in your entrance way … and I was instantly smitten and wanted to use that detail somewhere in my house … I held onto the idea for months and now did my own stripe project in one of our bedroom walk in closets … thanks for the inspiration! Amazing! You are so talented. The shower curtain is fabulous!! You really did a great job! 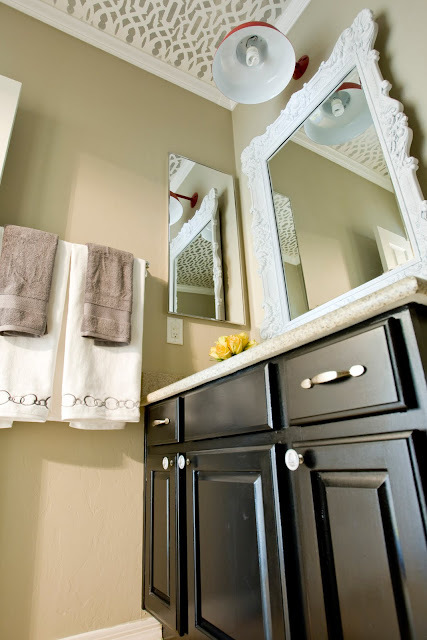 Your bathroom looks amazing..
WOW! It looks awesome! I love all your flea market and vintage touches! Fabulous! I have been waiting to see the unveiling! Super job! Oh.My.Heavens to betsy! Love this! So amazing, you go girl times a million!!! wow! i can’t believe you stenciled the ceiling! whew! i am trying to talk a client into installing wallpaper on the ceiling of her den, but after seeing this, i just might talk her into doing a stencil instead. i am sure it was a MAJOR chore. it looks awesome. i love the pops of yellow and that red light! Love it! The red light is so unexpected and perfect. Ugh.. Please come decorate my house!! Absolutely fabulous! Michelle, This looks wonderful! That ceiling and the red light fixture are a perfect combination. There you go again and blow me away with your amazing talent! Seriously! What CAN’T you do is my question? Well done! Wow! Super lovely job (adore the ceiling!!!). Also digging the yellow bird. You are so talented!!! That ceiling is AWESOME! It’s even more difficult to do stencils over your head. I just watched the finale of Design Star. You could totally TAKE that title! That ceiling is to die for! And kudos for taking the plunge and painting your builder vanity. Oh my gosh! The details you thought of, the way you did everything and styled it. I l.o.v.e it!!! wow! I love the transformation. I remember you were debating whether to paint the cabinet – good choice! It makes me want to tackle my builder bland kitchen cabinets! seriously never cease to amaze with your creativity and uniqueness….I love that you put the stencil on the ceiling! We just did crown molding and I love how you did the corners! looks fantastic. were you scared to paint your not so old cabinets? i would have been! they turned out just lovely! I have a couple of questions I was hoping you could answer! 1. How long did it take you to stencil the ceiling? 2. Would you recommend doing the ceiling or the walls first? P.S I have that same frame you painted yellow..I love it! Looks amazing – my favorite parts are the mirror, the ceiling (of course!) and the open shelving! LOVE it girl!!! and the ceiling- how clever! The pops of color really make the room. Wow! It is really a great makeover! Love your perfect accents in the pop of colour too! WOW!! This bathroom is simply amazing and inspiring. Way to go! I CAN NOT believe you tackled that ceiling with that stencil…you are AWESOME and very patient. It looks AWESOME!! I love the beehive hardware. That bathroom is amazing! I can not believe you stenciled the ceiling I hate painting ceilings can’t even fathom a stencil. But it looks gorgeous. You have a magic touch for sure. Yet ANOTHER fabulous made-over room in your home! 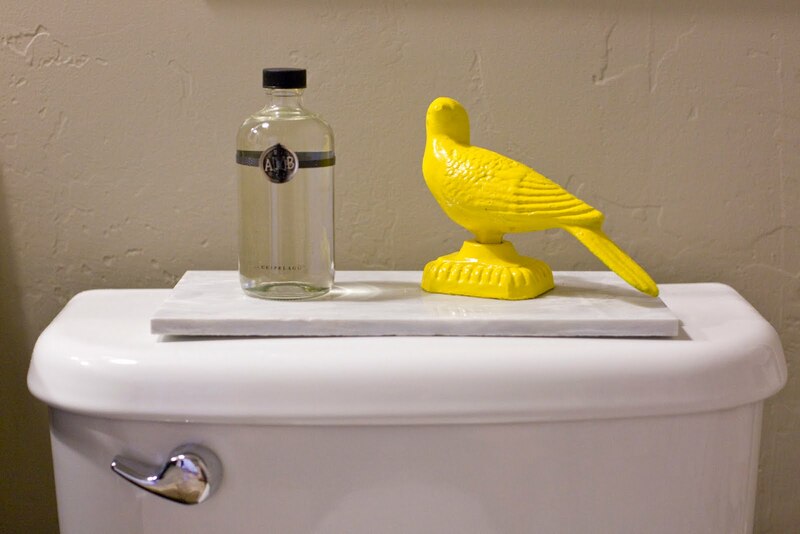 Every piece in that bathroom goes beautifully well together! 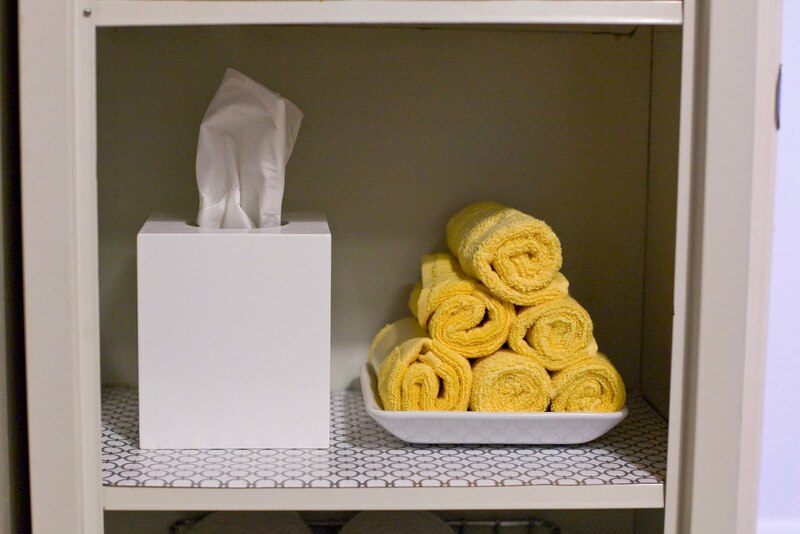 The only thing I was sad about was not hearing how you made or where you bought that super fab shower curtain? Please do tell! The bathroom is fabulous. Those pops of color really stand out and that ceiling makes the room. My eyes zeroed in on the art wall in the hallway. Have you ever featured that? I’m always curious to see how folks display kids art. Ooooh! Love love love the ceiling! It’s amazing! Everything is put together so nicely. Love the shower curtain, too. What can I say but………LOVE!!!! Wow, wow and one more WOW! I love love the ceiling and all of the details! Great job! oh. my. goodness!!!! I think you just gave me the nudge I needed. I’ve been wanting to paint my bathroom cabinets but I’m also in a new build house and thought oh I can’t do that. Oh yes I can! lol Looks fabulous!!! Amazing makeover. Visiting from BF. Love your blog design!! Wow, this is amazing! Gorgeous! I love it, you really did an amazing job on everything! I have a question though, how hard was it to move the light from the wall to the ceiling? We’ve been thinking of doing that in our bathroom and my husband thinks it will be too much work and we will need to get an electrician to do it. Was it a lot of work? Thanks so much! ummm… oops! Just kidding! Guess I should have looked closer at the pictures ;). 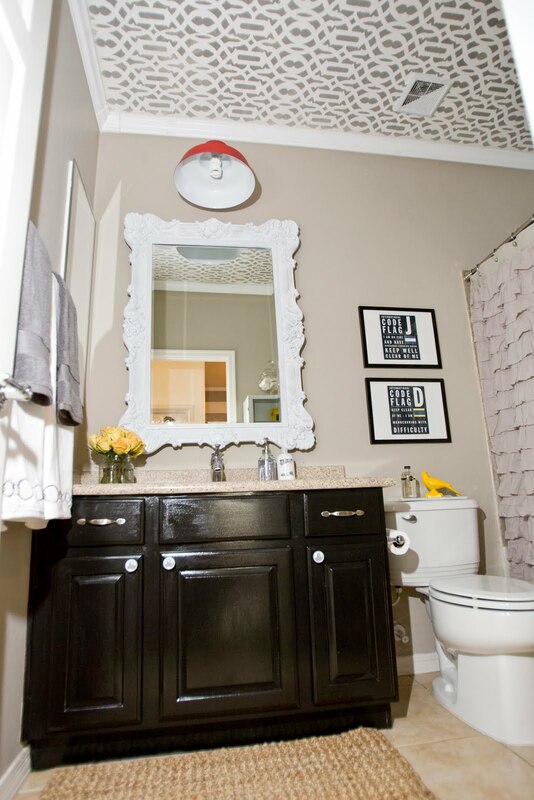 I am in love with a bathroom……..a stranger’s bathroom. I think you used too many different styles and colors in this room in a way that makes it look like a before instead of an after. There are some nice features, just too many doing too many different things. Sorry, I figure you want honesty. oh my goodness – i found your bathroom makeover on barn light electric’s facebook page and i LOVE it!! i am so inspired. 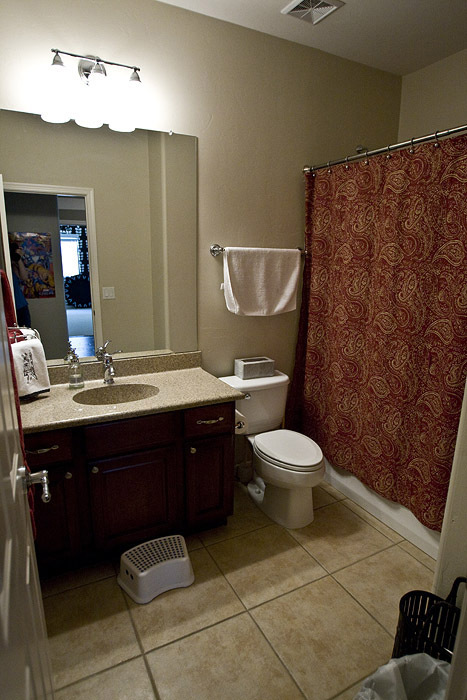 it looks almost identical to my little hall bathroom in size and layout – i may need to do some redecorating! thanks! Amazing. Congrats. Would you mind if I repost it in my blog (I’m from Spain), credited and linked back? I think you made a great job!! What color is this shower curtain? Is it the grey one or a tan color? LOVE it!!! How did you get the chandelier clipart in white? did you use adobe photoshop to convert black clipart to white? This bathroom is phenomenal! I came across it because of the stenciled ceiling in another post and that’s when I saw “it” …the most beautiful shower curtain I’ve ever seen. Love it! Amazing job!! Love it! What paint did you use for the ceiling? Great job…. Love the ceiling. Beautiful details! 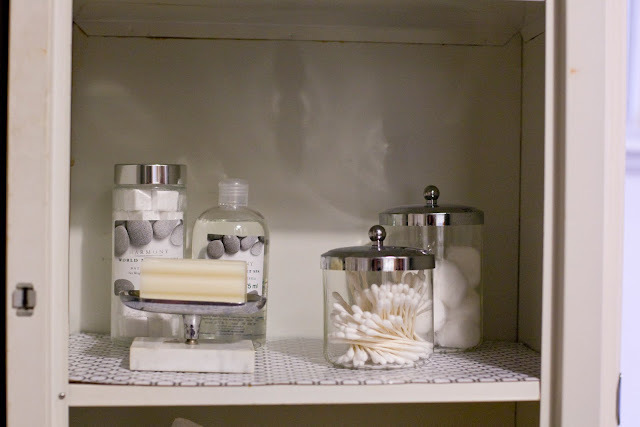 I linked this to my bathrooms post too – come on by and have a peek! You’ve got some maaad skills, lady! I love how you chose to put wall paper on the ceiling. The ruffled shower curtain and beehive knobs are such perfect touches! 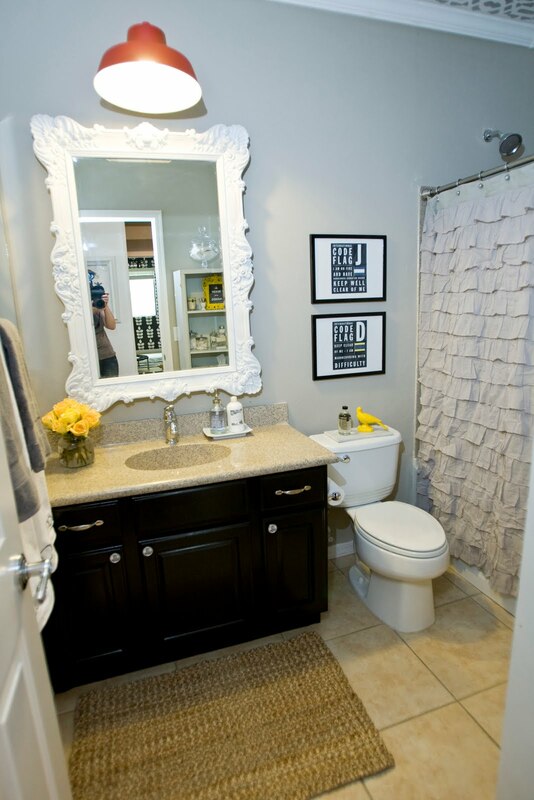 This bathroom re-do is AMAZING!! Awesome job! what brand/kind and color spray paint did you use to paint the bird?? I am trying to find a paint that will work well with wrought iron. Thanks! I believe it was Krylon yellow. Most all spray paints will work on wrought iron. Just make sure to read the label for special instructions. The ceiling is AMAZING!! I stenciled once … and I said NEVER again, and it was only a little bit of ivy. My hats off to you for what you did to make that ceiling pop! You mentioned where you purchased everything except the ceiling molding. It’s very unique and I have not seen it in any ‘home building’ stores. Where did you get it? I would love to put it in my bathroom.